The DSB Fall Leagues start in late August and run through the end of October. 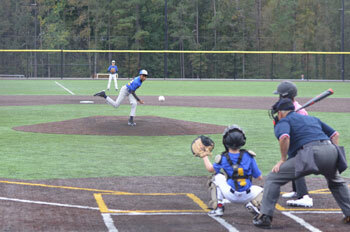 Most games are played at the new Brook Run Park Baseball Fields, which are located just across Barclay Drive from Brook Run Park and next to Peachtree Charter Middle School. Our new home boasts two a synthetic turf fields, start-of-the art LED lighting and a spacious concession plaza. Some games and practices may be held at other locations. Players can register individually and be placed on a team, or whole teams can enter to play. A player's age for these purposes is as of April 30, 2019. JV teams, 14 YO and 15 YO Travel Teams are encouraged to enter the Upper League. Any coach can recruit and enter a whole team. Please call/email if you intend to register an entire team in the Upper League. Read our playing rules here. We are always looking for good people to join our cadre of volunteers and coach teams. Please let us know if you can help-out. Contact information is below. Dunwoody Senior Baseball Contributions are welcomed and appreciated. If you or your company would like to advertise and support DSB by purchasing a banner, please contact Jerry Weiner 404-791-1841 or by e-mail at jerry@jerryweiner.com. Please contact one of the following people with any questions. Both the Lower League (13-15) and Upper League (15-18) are a 10-game season. We have a football friendly schedule, so you can play both baseball and football this fall. Please note on your registration form if you are planning to play football at the same time. In both leagues, we plan to schedule games outside of the league with teams from Druid Hills Youth Sports and the DSB Diablos. Games will be played at the new Brook Run Park Baseball Fields, but there may be occations where teams play some games at Medlock Park (Druid Hills Youth Sports field) or other area parks. Costs are $300 for an indiviual player. Registrations and payments submitted after August 31, 2018, are not assured of being assigned to a team. Whole team cost is $2,250. Click here to register a team. Checks or online payments are required to complete the process. Players will be provided shirts and hats by the league for players who are playing on one of our rec teams. Players are expected to provide baseball pants, belts, socks and shoes. Whole teams that enter the league typically provide their own uniforms, but if needed, DSB can supply jerseys and hats for an additional fee. On-line registration runs from early July through August 17, 2018. Checks or online credit card payments must be in our possession by Monday, August 21 to complete the registration process. Everyone that registers will get to play but there are mandatory player evaluations on the West Field at Brook Run (next to Peachtree Charter Middle School). In the event of rain that day, check this web site for further information. Walk in registrations are accepted on a space available basis. Coaches Meeting, for both Lower and Upper Leagues, at DSB Field House at the Brook Run Park Baseball Fields. Practices. Pre-formed teams can receive field time prior to this date. 10 game season plus playoffs, 2-3 games per week. Games played primarily on primarily on Tuesdays, Thursdays and Sundays. Click here to register a team.